Pipe Perfection Plumbers work hard to think through your plumbing-related problem or challenge to get the solution right, the first time. We operate on our Pipe Perfection Plumbers Code – our manifesto for excellence. Our work has a 6-year labour warranty and we make a big effort to search out products backed by a strong manufacturer’s warranty. That’s a win-win for you and us! Ready to get happy with your plumbing service? 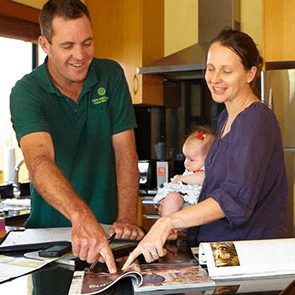 Call us on 1300 007 043 and discover just how good a plumbing service can be. I just wanted to say that my husband and I were so impressed by the service we received from Pipe Perfection. They turned up 5 minutes early and politely waited till 7am to let us know they had arrived. They offered to remove their shoes everytime. They always closed the door behind them to minimise noise, but they worked quietly anyway. Obviously Tim and I have no experience in plumbing, but we feel confident that not only did it look like they were doing a good job – they actually did a very good job – they certainly followed all steps outlined in their work order. We would recommend using the same company for our strata plan plumbing works in the future. – Maria Vasic.